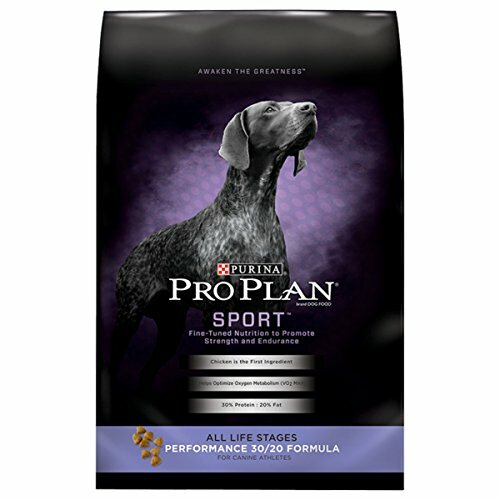 Help your dog excel with the nutrition of Purina Pro Plan SPORT Performance 30/20 All Life Stages dry dog food. Designed for active dogs, this dog food appeals to owners of sporting dogs, cattle dogs, and canine athletes. The recipe concentrates nutrition to help optimize oxygen metabolism for increased endurance and contains a blend of 30% protein and 20% fat to assist in caring for your dog's metabolic needs and help him maintain strong muscles. This delicious recipe features chicken as the #1 ingredient and provides your dog with the protein and nutrients he needs for his active lifestyle. EPA and glucosamine help support joint health to make running and jumping as easy for your dog as possible. The tasty, antioxidant-rich recipe doesn't just fuel your dog's body, though, it also nourishes his immune system and helps defend it against free radicals. Get your canine companion what he needs when he needs it with just a few clicks by placing an order for Purina dry dog food today. Crude Protein (Min)...30.0%, Crude Fat (Min)...20.0%, Crude Fiber (Max)...3.0%, Moisture (Max)...12.0%, Linoleic Acid (Min)...1.8%, Calcium (Ca)(Min)...0.9%, Phosphorus (P)(Min)...0.7%, Selenium (Se)(Min)...0.30mg/kg, Vitamin A (Min)...15,000 IU/kg, Vitamin E (Min)...500 IU/kg, Ascorbic Acid* (Min)...100mg/kg, Docosahexaenoic Acid (DHA)*(Min)...0.12%, Eicosapentaenoic Acid (EPA)*(Min)...0.12%, Glucosamine* (Min)...500 ppm. *Not recognized as an essential nutrient by the AAFCO Dog Food Nutrient Profiles. Recommended Daily Feeding: We recommend that you keep your dog in ideal body condition and not allow your dog to become overweight. The exact amount of food your dog requires will need to be adjusted according to age, activity and environment. But a good place to start is with these guidelines for an average, active, adult dog fed once daily. Feeding Weaning Pups: Start puppies on dry or moistened Pro Plan as early as they begin to nibble at solid foods, generally 3-4 weeks of age. Feeding Growing Pups: Feed pups (to six months of age) all of the moistened Pro Plan they will consume at intervals throughout the day. If fed dry, Pro Plan may be kept before pups at all times. Making the Switch to Pro Plan: Although you'll be anxious to see the difference Pro Plan can make in your dog, please allow 7-10 days to ease the transition from your dog's current food. Each day, simply feed a little less of the previous food and a little more Pro Plan until you're feeding Pro Plan exclusively. This gradual transition will help avoid dietary upsets. Provide adequate fresh water in a clean container daily. Feeding for Reproduction: Pro Plan provides the extra nutrition needed by reproducing females in stages of gestation and lactation. Food consumption may vary during gestation, so feed the amount needed to maintain the pregnant female's ideal body condition Food intake may double or even quadruple during lactation. For your pet's health, see your veterinarian regularly. Store in a cool, dry place.